The Jaguar Reef Lodge is a full service hotel in Hopkins and offers a number of tours to explore the eco-wonders of Belize's diverse wildlife and landscape. Guests have free access to kayaks and mountain bikes to undertake adventures on their own on the ocean and the surrounding areas. The Jaguar Reef also has a nice restaurant overlooking the beach, serving excellent breakfasts, lunches and dinners made with locally grown fruits and vegetables. Every cabana and suite at the Jaguar Reef Lodge provides the sense of spacious privacy. They were built thinking in your comfort, providing a relaxing and cool environment. The cabanas features tile floors, ceiling fans, mahogany furnishings and mini bar. The spacious suites offer a large living area and kitchenette complete with TV, DVD player and stereo as well as a coffee maker and features beautiful mahogany furnishings throughout. Upper level suites have big balconies and the lower suites offer a spacious deck. 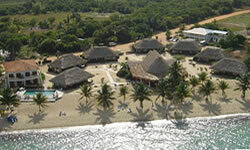 All rooms and suites are air-conditioned and bathrooms include tiled bathtubs and showers as well as hair dryers.